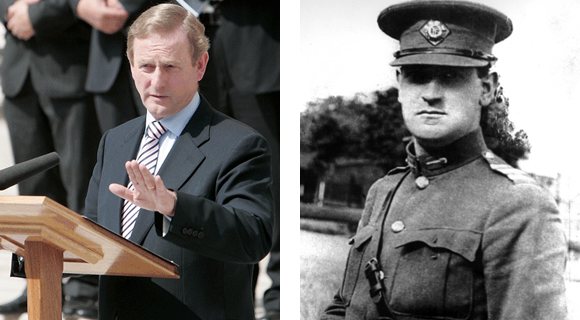 The Irish Times reported today that Irish leader Enda Kenny had made clear that Michael Collins would have supported the government’s economic policies—i.e. paying back billions in loans given to rotten banks by European banks. Collins will be 90 years dead this week, hence the Kenny speech at the annual commemoration—but I seriously doubt if he was alive he’d agree with the economic policy of this Irish government, or the previous one. Indeed, I could see him leading the charge outside parliament, hurling the “little streets upon the great” as Yeats so wonderfully wrote. Once a revolutionary, always one. Given his revolutionary past he would hardly be likely to accept that the Irish people put themselves into near bankruptcy to serve foreign banks. Collins would be much more likely to put two fingers in the air to Brussels, Germany, and all their works, and tell the Irish people to cop themselves on. He would have been outraged over the corrupt bankers and the gombeen men who brought Ireland to its knees — and at the politicians who allowed the crimes to fester. Collins would have been standing with the ordinary people and not the establishment on this one. Collins is Ireland’s most iconic figure and Irish America’s too. When we did a poll last year as to the greatest Irishman he won hands down. His legend lives on –sometimes in extraordinary and hilarious ways. There were two wonderful student rascals let loose here in America this summer who had brought along a huge cardboard cutout of Michael Collins and posed with photographs of him everywhere – in subway stations, Empire State Building, et cetera. It spoke volumes about the stature of Collins that even kids today there clearly revere him. That is as it should be. He has become the most iconic figure in Irish history.